After years of experience with geared pegs I originally found the planetary gear pegs to be the best overall, but have since altered my views on the available geared pegs. I have tested both the “Planetary Perfection” peg by Knilling and the “Fine Tune” pegs by Wittner. My reviews are completely independent. The Planetary Perfection pegs feature internal planetary gears that are located inside the shaft of the peg, whereas the Fine Tune pegs feature gears that are found inside the peg head. Both pegs look like traditional pegs although the Perfection pegs have a sleeker looking head because it does not contain gears. The plastic version Perfection pegs have a seam line that detracts from the look of the peg, however I was able to remove this seam with sanding and polishing with desirable results. 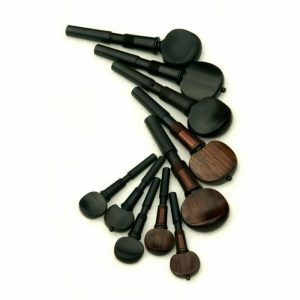 The Perfection pegs are also available in a number of wood heads and have custom options. The Fine Tune pegs come in black as well as a rosewood finish. Because the gears are inside the head of the peg they end up looking a bit bulbous. The Perfection pegs have very fine threads on the wider end of the peg shaft that are threaded into the peg box hole and are to be glued in place. Removing the pegs is a simple process that does not damage the instrument in any way. The Perfection pegs can turn very nicely with just the right amount of fine movement to easily tune even the E string on a violin with practice. However, after years of installing these pegs I have found the mechanism to be inconsistent in feel from peg to peg. Some pegs seem tight and even squeak when turned, others feel loose and feel like they will slip even when they are holding tension. The action is usually smoother after the initial break in period. The taper of the internal gears allows some ability to increase or decrease the motion of the turn by pulling the peg head in and out. They can even be pulled out a few millimeters which releases the gears and allows the peg to spin freely until the gears are re-seated. Many players struggle with this, especially at first. This is the other problem with these pegs — they require practice and understanding of the mechanics — some clients catch on quickly, for others it takes longer. So sadly the Perfection Pegs are a little less than perfect. The Fine Tune pegs by Wittner are supposed to be able to be installed without gluing the shaft into the peg box. This is supposed to give the peg an edge in older instruments if the owner ever wanted to go back to traditional pegs. However, the ridges that are supposed to hold the peg in place and keep it from spinning independently of the gears are not up to the task over the long run through climactic changes. I install them with a small amount of glue. The tuning is fine and functional, much like the tuning machines on a guitar, except with a “clicky” feel as they are turned. These pegs are completely plug and play, there is no period of adjustment at all, and they always have the exact same feel when turned. The downsides of these pegs are; 1) that they can not be made of wood, 2) only come in two finishes, 3) look a bit large, and 4) string changes can take longer because of how many turns it requires to unwind and wind the strings. These geared pegs are comparable in costs for the pegs and installation. Sometimes an older instrument will require peg hole bushing, which can make installation more costly, but there are custom options now for the planetary pegs that can get around this issue. For seasonal stability, far less time spent tuning, the elimination of fine tuners, and zero struggles with keeping pegs wedged in just right, the geared peg options are almost a no brainer if you can afford them. It comes down to choosing which ones are right for you. For a more elegant look with many options the planetary pegs are the way to go. For simple ease of use with no fuss the Wittner pegs are best. Feel free to contact us for more information about installation and cost.